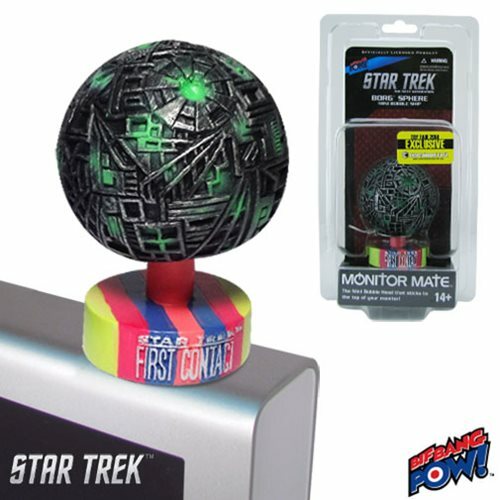 Add this rare exclusive warehouse find Toy Fair 2014 Exclusive Borg Sphere to your Star Trek computer monitor mate collection! Raise shields and arm the photon torpedoes! Imagine this limited edition incredible Borg Sphere with it's Toy Fair color striped base looming over your desk, threatening all with assimilation! It measures about 2-inches in diameter, stands approximately 3-inches tall including its base, and adheres to your computer monitor with a non-damaging adhesive pad. The finely detailed mini bobble head presents a patchwork of tubes and conduits on all sides in black, silver, and green, and is made of resin. The base features the Star Trek: First Contact logo. Collect your own piece of the Collective! Ages 14 and up. The Borg Spheres were used by the Borg as long-range tactical vessels and as scout ships in Star Trek: First Contact. Their goal is to prevent an historical event on Earth known as First Contact Ages 14 and up.